Enter the exhibit past shark jaws ranging in height from 2-9 feet, including the jaw of the extinct giant — Megalodon — largest shark that ever lived. 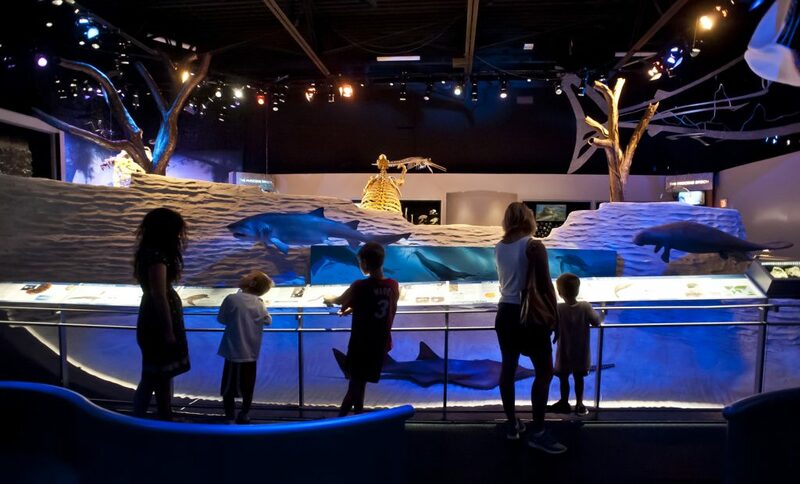 The exhibition begins with five extinction events described in dioramas that lead visitors onto the Florida Platform at about 65 million years ago, also known as the Dawn of the Age of Mammals. 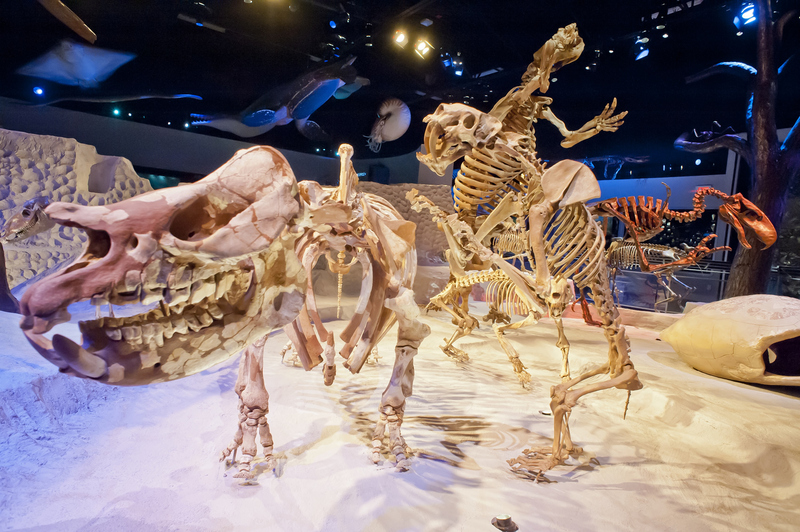 Travel around the exhibit’s central island and witness the fossil history of Florida during the Eocene, Oligocene, Miocene, Pliocene and Pleistocene epochs. See Florida’s first land animals and an amazing parade of life through the ages. 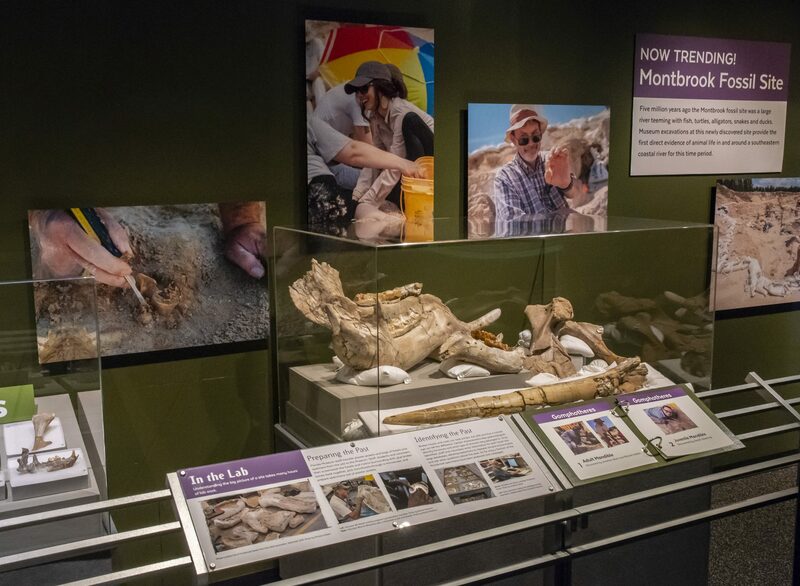 The exhibit ends with the arrival of humans in Florida near the end of the Pleistocene. Be visually awed by full skeletal mounts and sculptures in exciting life-like postures, and touch bronze sculptures (one-sixth scale models) of what the animals looked like in life. Each time period includes numerous animals, artwork, video and more. 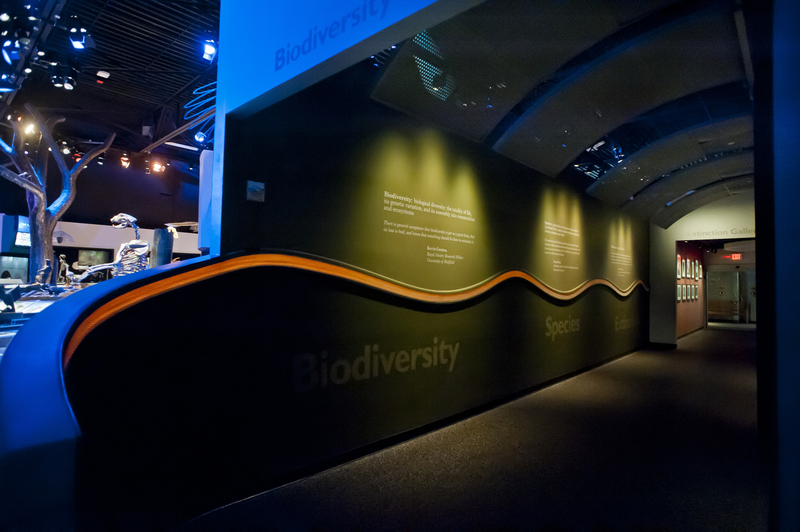 Enjoy fossil-related temporary displays and learn about Earth’s Sixth Extinction — a modern crisis caused by humans. 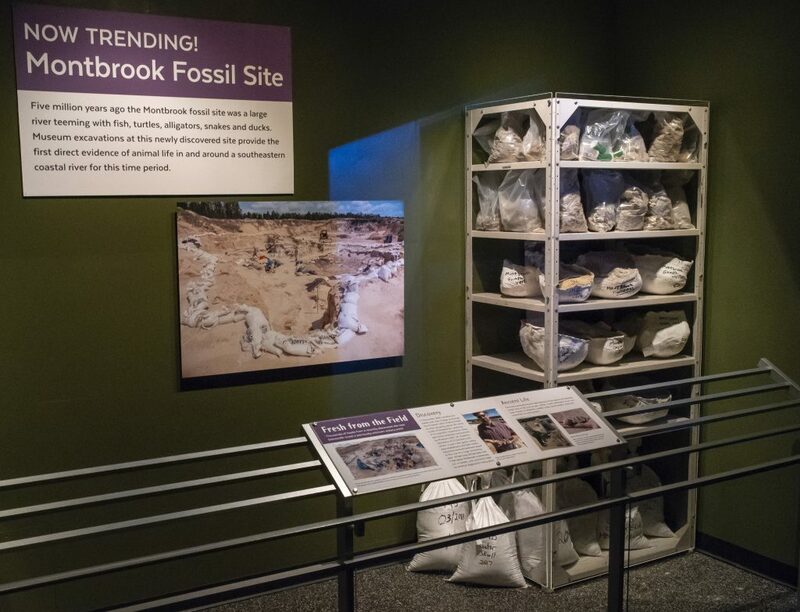 Discover the history of the Montbrook site and the process of collecting and cataloging fossils from the field to the lab. Learn about the latest findings by museum staff and volunteers with more than 30 specimens from the Montbrook site. 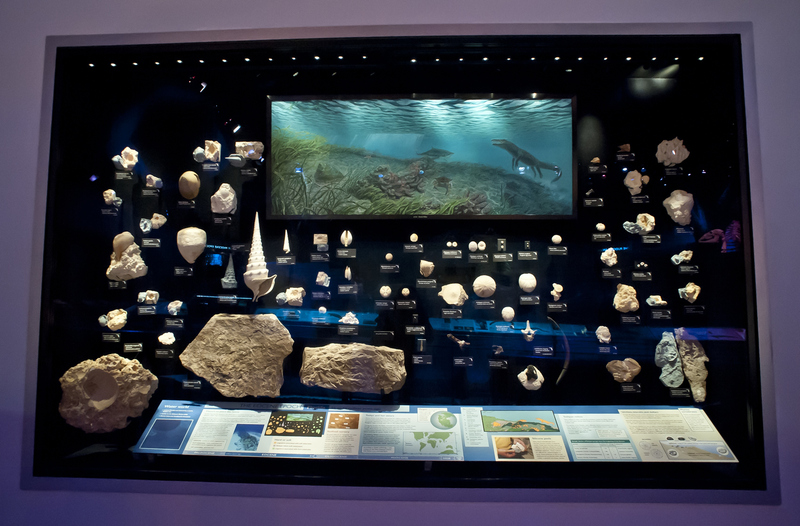 A display of more than 30 specimens found by volunteers and researchers educates visitors about the process of collecting and cataloging fossils from start to finish. Learn about the 5-million-year-old Montbrook dig site located in Levy County, Florida, with high-res images. 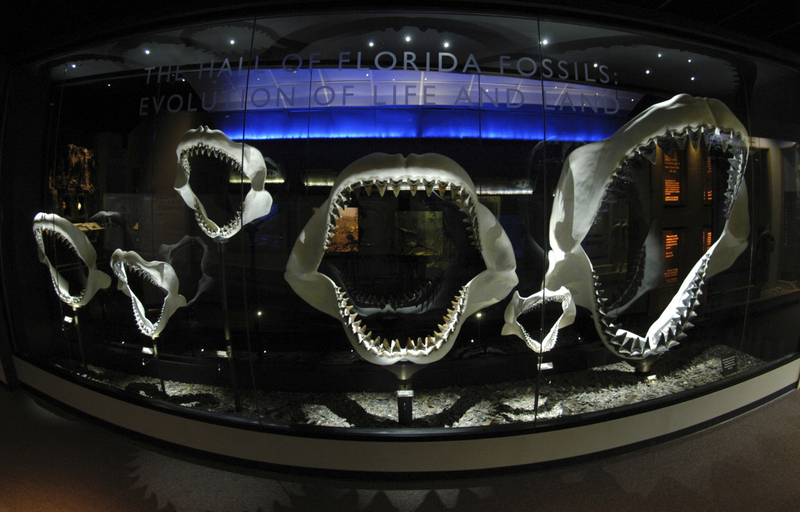 More than 90 percent of the exhibit’s 500 fossils are real, and many were found within 100 miles of Gainesville. About 3 million years ago (Pliocene), North and South America became connected by a land bridge that allowed animals to move between continents. Armadillos, ground sloths and glyptodonts went north, while bears, camels, horses and dogs went south (among others!). Florida’s geological history spans at least 500 million years. A sea turtle is Florida’s oldest known vertebrate fossil — 100 million years old — from the Age of Dinosaurs (Mesozoic), when ocean covered the state.